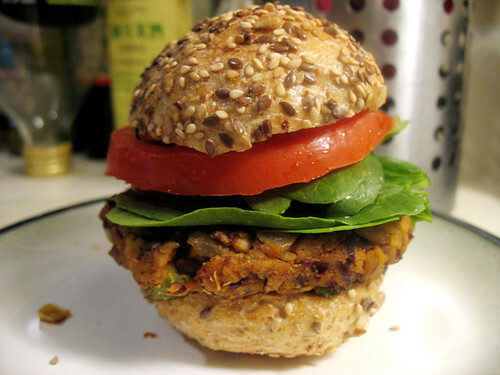 When the delightful Lindsay of Cook.Vegan.Lover invited me to be a tester again for her latest ebook, I knew I would get to try some delicious recipes, but I hadn't expected to find a new veggie burger at the same time! 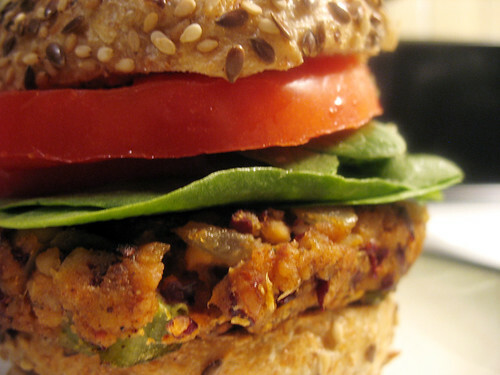 The recipe for Fiesta Tempeh-Bean Burgers is marvelous. They're vegan, and the patties hold together better than most non-vegan burgers that use eggs as a binder, because Lindsay has figured out the perfect combination of ingredients to make that happen. 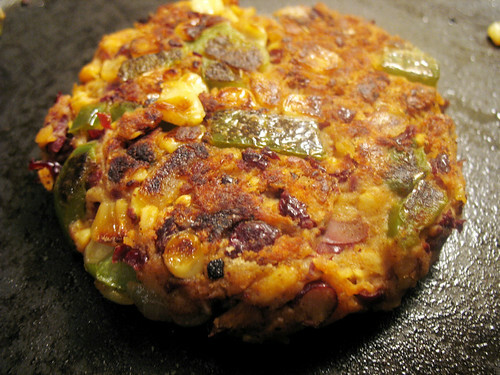 Even though they're called bean burgers, they aren't as bean-centric as most bean burgers that I've tried. Here, the beans combine with other vegetables resulting in great texture and flavor. Slightly spicy, very savory, and filling. And they were really easy to make, thanks to the handy-dandy second-hand food processor that I inherited from my good friend Jeremy! The recipe could be pretty versatile too if you wanted to add or remove certain vegetables, or try different types of beans. The recipe makes six burgers, but since I was only cooking for myself that day (what can I say, it was a snow day and everyone else was at work) I ended up freezing the extra patties. And they were just as good when I heated one up in the frying pan a few days later. the burger patties aren't small, the (delicious) rolls I bought near my apartment are just oddly-proportioned and make them look funny! I loved these, and will definitely be making them again (now that I've eaten all the ones I had stored in my freezer). 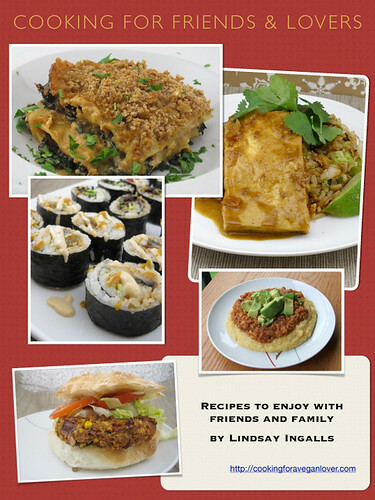 ...and yes, that is vegan sushi you see on the cover! UPDATE: Lindsay has posted the recipe on her blog as well - you can find it HERE. I so thought, (hoped) you were going to get permission from Lindsey to share this one recipe. It looks like it has a perfect crunch/smoosh ratio. I was not a fan of burger until I tried THIS. I admit, it's awesome. THANK YOU!